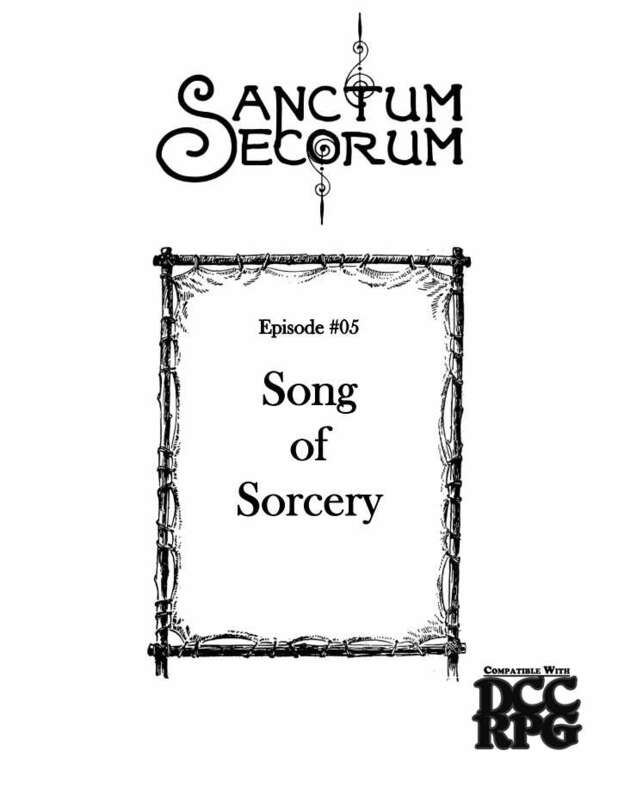 The Sanctum Secorum Episode #05 Companion: Song of Sorcery was written by Jen Brinkman, David Baity, and Bob Brinkman. Art is by Andrea Piera Laguzzi, phodyr, roguewyndwalker, TRegnier2795, and Wizardkeyes. The publisher is Sanctum Media. This product is produced in association with the Sanctum Secorum podcast. 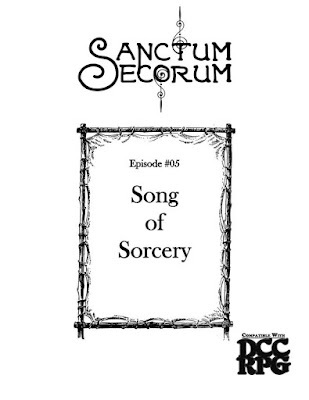 This Episode Companion is based on Sanctum Secorum Episode 5: Song of Sorcery, which discussed the novel by Elizabeth Scarborough. The featured adventure was Prince Charming, Reanimator, by Daniel J. Bishop. Disclosure: I wrote the featured module for this adventure. Another adventure I wrote, Mermaids from Yuggoth (from In the Prison of the Squid Sorcerer) was also discussed. Redcap Gnome: "You are a tiny protector of the forest and the diminutive creatures that share your home. You spend your days gathering herbs and roots to use for the evening’s stew, or help brew a healing salve for a friend who ventured into the cruel jaws of a huntsman’s trap." Author David Baity provides a playable class that seldom exceeds 20 centimeters in height. For another take on the gnome, see Crawl! fanzine #6. Hearth Witch: Not all spellcasters are great wizards or clerics wandering the land. Nor are all witches of the type found in the Dungeon Crawl Classics core rulebook. Bob Brinkman provides a hearth witch class, usable for PCs or NPCs as the judge desires. Gypsies: "The term gypsy is used to broadly describe all number of tribes of traveling folk, most often living in large, extended family communities and traveling via colorful wagons drawn along by horses. While good folk among their own numbers, many of the traveling folk are near xenophobic of outsiders, viewing them with grave mistrust and often as the target of varied larcenies to further the survival and well being of the clan. While any of the folk will take advantage of an outsider should the need arise, if their word is given, it is their bond, and any accepted as one of their number will forever be counted among them." Author Bob Brinkman provides game statistics for gypsy dancers, gypsy grooms, gypsy kings/queens, gypsy musicians, and gypsy urchins. Argonian Mermaids: Jen Brinkman provides statistics for these sirens, who can be civil enough even if they want to drown people. Black Swan, Giant: Exactly what it sounds like. Black swans are also mentioned in The Fellowship of the Ring (perhaps being the source of the fletching used on orcish arrows? ), but they are certainly not as big as the ones Bob Brinkman describes here, which are large enough to use as mounts. Creeping Willow: Also reminiscent of The Fellowship of the Ring (in particular the Old Forest), these are moving trees that may obscure paths. Bob Brinkman's write-up can be modified to fit the works of J.R.R. Tolkien by those who are interested. Siren: Another write-up of the Argonian mermaids, this time by Bob Brinkman. Bind the Heart: A 2nd level hearth witch spell by Bob Brinkman. As with previous Companions, this volume can help the discerning Dungeon Crawl Classics judge determine how to stat up creatures from whatever movie or literature he likes.